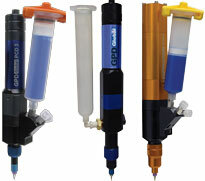 Retrofit or integrate Precision Dispense Pumps into your dispensing system to improve fluid dispensing results. In addition to Precision Dispensing Systems, we also offer a selection of individual pumps to retrofit into your dispensing systems. Purchase an individual pump that meets your needs and easily retrofits into your platform. Retrofit your liquid dispense system with any of these fluid dispensing pumps. Retrofit a Precision Auger Pump (PDF) into your dispense system. Solder Paste, Conductive Adhesive, Abrasive Thermal Gel, Dam and Fill, Gasketing, and more. Retrofit a NCM5000 Jetting Pump (PDF) into your dispense system. SMT Glue, Underfill, Fluxes, UV Cureables, LED Encapsulation, COB Encapsulation, and more. Retrofit a Volumetric PCD Pump (PDF) into your dispense system. Silicones, Conductive Ink, Underfill, LED Encapsulation, COB Encapsulation, Solder Mask, Grease, Conformal Coatings, and more. Retrofit Time Pressure (PDF) into your dispense system. Full range of fluid viscosities. Retrofit a Time Pressure with FPC (PDF) into your dispense system. Retrofit a Precision Auger Pump (PDF) into your dispensing system. Retrofit a NCM5000 Jetting Pump (PDF) into your dispensing system.